Home Articles What Aston Villa can Learn from ‘Plucky’ Performances? Are They Enough? What Aston Villa can Learn from ‘Plucky’ Performances? Are They Enough? As the claret and blue faithful sat down to watch Aston Villa against Manchester United recently a couple of things will have been going through our minds. If you were to cast your mind back to the Man United home game last season… you’d have struggled. It was a forgettable match. This time around, at least we saw more of a “no fear” approach that impressed the pundits and was entertaining to watch, regardless of the end score-line. Hold on to the 2-0 and win – and Villa would be laughing. Such is the thin-line at the moment. After losing to Southampton back in September, Paul Lambert told media of the importance of keeping a level head and the “ups and downs” that teams face during the season. There are certainly signs that this will be the case, and anyway, surely a rollercoaster ride of a campaign is preferable to the broken down merry-go-round of last season? The claret and blue rollercoaster seemed to temporarily grind to a halt last weekend as Lambert’s Lions faced Manchester City. The same squad that rattled Fergie and deserved to feel a little confident, failed to emulate such a performance, admittedly while being dismantled by dodgy decisions. What we have to learn is that we need to approach each game with the levelheaded mentality Lambert has called for. With the two Manchester fixtures and the upcoming Arsenal match, we are in the midst of something of a ‘Trilogy of Terror’, but is it right to approach these matches this way and just be happy we’re being plucky? Look at what Norwich achieved last weekend against United. It’s football, and the Premier League is unpredictable. Taking down the so-called giants is always particularly satisfying, but not if it comes at the cost of six-pointer victories. The three teams that got relegated last season all threw their punches at the big boys. Bolton achieved victories over Everton and Liverpool (as well as beating QPR 4-0 and Stoke 5-0). Blackburn saw off Arsenal and Man United. Wolves took a point apiece from Arsenal and Tottenham, to cite a few examples from each club’s record. Yet it didn’t help any of them in the long run. Benteke vs Kompany in the Battle of Belgium. If Villa keep ‘plucking’ away, the points will come. In fact, if we think back to the Bolton home game near the end of last season, we should be giving ‘six-pointer’ clashes a lot more attention. The aforementioned ‘Trilogy of Terror’ in the fixture list was always going to be difficult for Aston Villa, but at the same time plucky performances cannot then fizzle out when playing the likes of Reading (H), QPR (A), and Stoke (H), who are next on the fixture list. They should be approached in the same way Villa would approach a team of Zlatan Ibrahimović clones. Last season the grief of fans was occasionally eased by impressive performances, with the Arsenal home game (in which we were unlucky to lose) and the Chelsea away victory springing to mind. Failure to sustain these performances had its effect on where Villa finished in the table. As if to highlight the importance of these matches, December provides a further ”Trilogy of Terror’ with away matches at Liverpool and Chelsea and a home game with Tottenham. It isn’t a case of simply saying, “the season starts after Arsenal”, because we’ve already had games we should have taken points without doing so. At the same time, we have also had signs of a team who are starting to gel, but they can’t afford to fall apart in the lesser matches that follow. Of course, a bit of luck will help us, but sustaining the effort or the ‘pluck’ is essential, and for a full 90 minutes, not just 45! 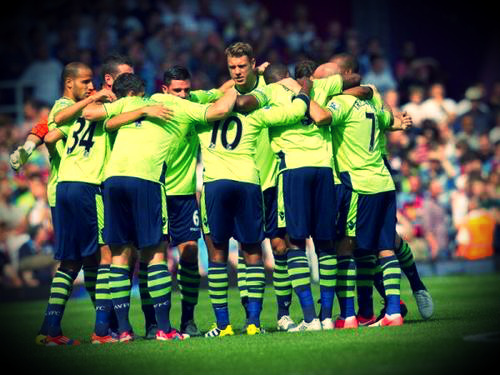 Confidence is everything – but sustaining these plucky performances will be the key to Villa’s success this season.